The Gemini January 2016 Horoscope predicts that majority of the planets are in the upper hemisphere of the natal chart indicating strong focus on career. Family concerns will be in the background while your professional goals will get a boost from the family for the Twins. January 2016 shows that planetary power is concentrated in the Western sector of the horoscope during the month. Dependence on your social circle will be more important than exercising your free will. Geminis, this is a period for conciliation and adaptability if you want to advance in life. You will achieve success in your professional life or business by hard work and probably with the guidance of one of your family members in the organization. Attention should be paid to thinking about your future goals in your profession while your previous plans become successful during the month. The January 2016 career predictions for Gemini foretell that job seekers should be more tolerant after 20th if they have to get good jobs. Overall situation is excellent for the unemployed. Financially January 2016 is a normal month for the Twins in spite of the various challenges you will have to overcome. You will have to work out a new strategy to keep money flow constant, thanks to the Mercury Retrograde this month. First two weeks of the month will see excellent cash flow while the latter part of the month will see a diminishing inflow. The Gemini monthly astrology forecasts for January 2016 predict unexpected flow of money from unknown sources. January 2016 love horoscope for Gemini zodiac sign shows that love relationships will be normal till the last week of the month. Family will be a source of irritation in your affairs. Your relationship with your mate will be sexually tempestuous and will be under serious threat. However, real love will flourish in the end of January 2016 for the Gemini birthday. Family environment will be vitiated by planetary influences during the last week of the month. Singles will find soul mates in social circles or overseas. You are advised against getting married or planning to get pregnant during this month. The Gemini 2016 January forecasts foretell that you will have excellent drive and confidence. This will result in outstanding health especially after 20th. Health can be improved by aura cleansing of the body. 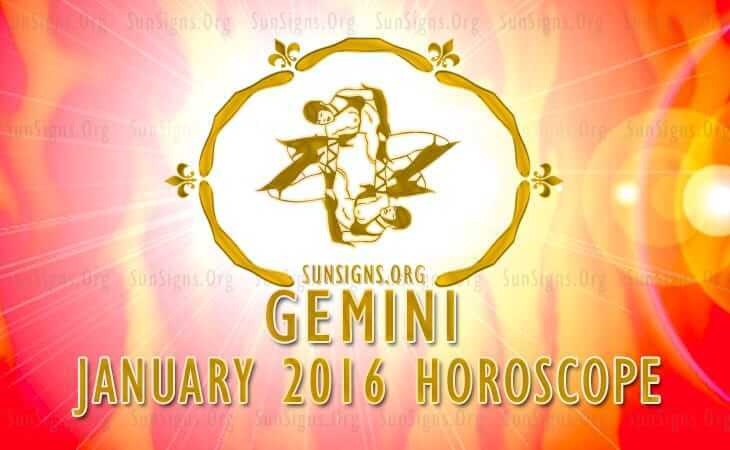 To conclude, the Gemini January 2016 horoscope predicts a month of successful business and career pursuits.